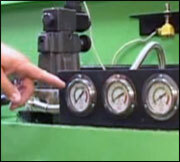 Need to efficiently operate your tube and pipe bender? You’ve come to the right place. We believe that training and continuing education is absolutely vital to your success. Not only will your engineering and production become more efficient, but your company will be producing exceptionally high quality bends immediately with our guidance. 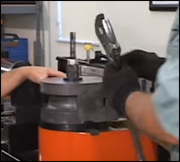 If you are an expert or have a lot, some, a little or no bending experience whatsoever, Hines Bending’s comprehensive course will thoroughly train your and or your staff on your machine, maintenance, bending, tooling and trouble shooting. We teach state-of-the-art techniques that will give your company the production levels you are seeking. By the end of the day, you will be bending parts and acquired some major tricks of the trade. Free. When you purchase a new Hines Bender, training at our headquarters at Hines Bending in Fort Myers, Florida is free. Fee-based. If you need us to travel to you, we can travel to your production site. We are happy to provide a cost estimate if you require on site training. Please contact us for training and seminar availability. Over the years we have helped companies enter the tube and pipe industry using the most econmical path. We consistently offer the most popular and affordable tube and pipe benders in the industry – semi-automatic NC and fully automated CNC benders. 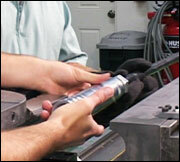 All of tube and pipe benders have proven to be simple, strong and reliable. 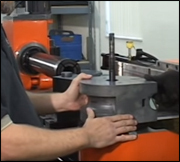 We help you choose the correct machine and associated tooling. Importantly, in less than a day’s of training, you will be efficiently producing parts. Below are two important tabs – Operator Setup and Pipe Distortions. Access Operator Setup for guidance on dies and clamps. Access Pipe Distortions to find solutions for various results on pipe and tube materials. HINES BENDING’S PRESIDENT AND CEO JIM HYNES INSTRUCTS A TRAINEE ON WHAT TO LOOK FOR IN A QUALITY BEND. 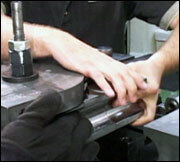 APPLYING PRESSURE TO ENSURE THE BEND DIE IS LOCKED TIGHTLY INTO PLACE. 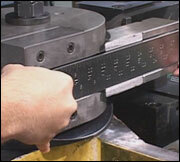 LOWERING THE BEND DIE ONTO the MACHINE MAKING SURE THE DIE IS ALIGNED, SETTING LEVEL AND TRUE TO THE MACHINE. LEARNING TO INSTALL A MANDREL.